for the women~s FitFlop sizing guide. Click to learn more about the biomechanically engineered, ergonomic FitFlop&amp#174 footbed. Perfect for life~s many adventures, these sandals are sure to be your go-to style for wherever the day takes you. Leather upper in a classic silhouette. Soft microfiber interior lining helps prevent abrasion. Triple-density EVA midsole with sophisticated Microwobbleboard technology. Please click for a video about Microwobbleboard technology. Textured synthetic outsole delivers long-lasting durability on a variety of surfaces. Imported. Measurements: Heel Height: 1 1 2 in Weight: 7 oz Platform Height: 3 4 in Product measurements were taken using size 8, width M (B). Please note that measurements may vary by size. Weight of footwear is based on a single item, not a pair. for the women~s FitFlop sizing guide. Click to learn more about the biomechanically engineered, ergonomic FitFlop&amp#174 footbed. 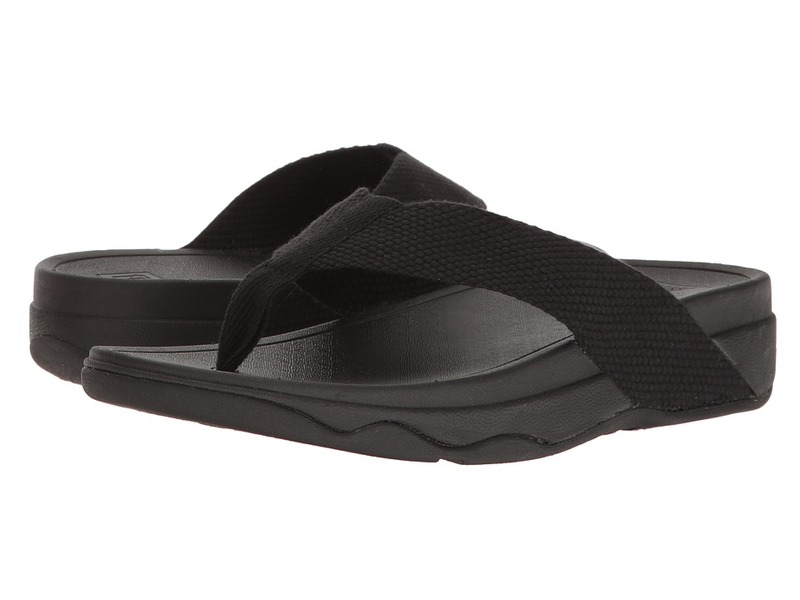 Go anywhere in the FitFlop Trakk II sandal. Thong sandal features faux leather upper with slim toe post. Soft microfiber interior lining helps prevent abrasion. Triple-density EVA midsole with sophisticated Microwobbleboard technology. Please click for a video about Microwobbleboard technology. Textured synthetic outsole delivers long-lasting durability on a variety of surfaces. Imported. Measurements: Heel Height: 1 3 4 in Weight: 11 oz Platform Height: 1 1 4 in Product measurements were taken using size 11, width M (D). Please note that measurements may vary by size. Weight of footwear is based on a single item, not a pair. for the women~s FitFlop sizing guide. Click to learn more about the biomechanically engineered, ergonomic FitFlop&amp#174 footbed. What is that? Is it a clog, or is it a shoe? Oh, I know, it~s a slipper! You know, call it what you want and wear it how you like. 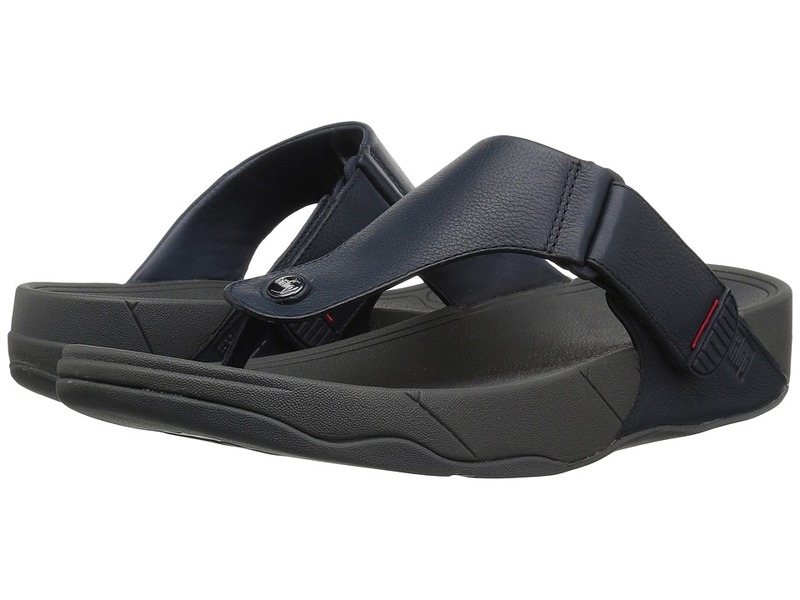 Introducing the stylish and versatile Shuv&amp#8482 from FitFlop&amp#8482. 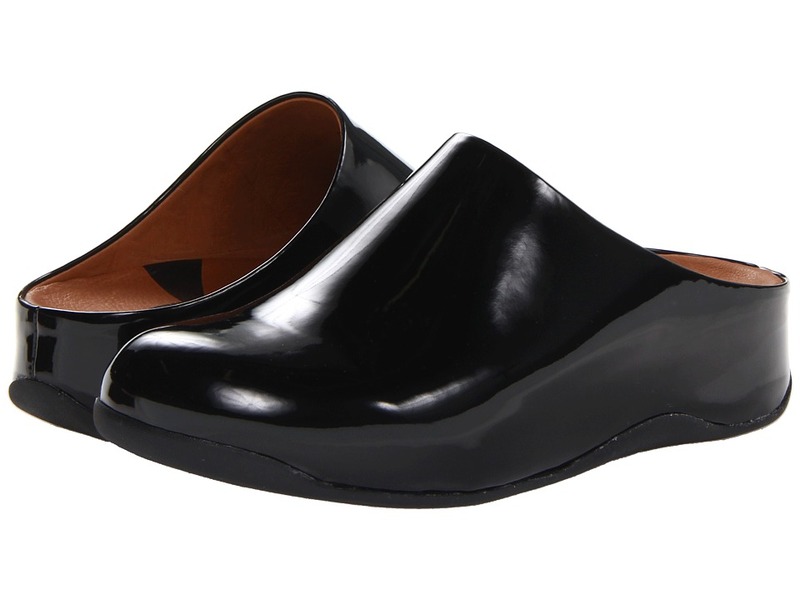 Faux patent upper in a single mold piece that is designed in a slip-on silhouette for easy on-and-off wear. Microfiber lining has been treated with anti-bacterial AEGI&amp#8482 to help prevent odors. Triple-density EVA midsole with sophisticated Microwobbleboard&amp#8482 technology. Please click for a video about Microwobbleboard technology. 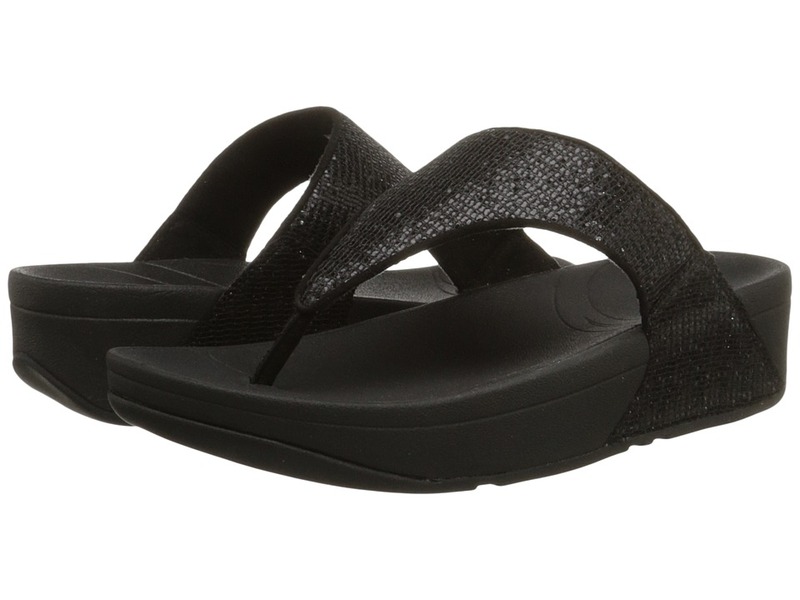 Textured outsole within embossed FitFlop logo that delivers long-lasting durability. Imported. Measurements: Heel Height: 2 in Weight: 10 oz Platform Height: 1 in Product measurements were taken using size 9, width M (B). Please note that measurements may vary by size. Weight of footwear is based on a single item, not a pair. for the women~s FitFlop sizing guide. Click to learn more about the biomechanically engineered, ergonomic FitFlop&amp#174 footbed. Make a style statement with fabulous flair in these FitFlop slides. Synthetic upper with eye-catching beaded embellishment at the front. Soft microfiber lining. Microwobbleboard EVA midsole features a high-density heel, low-density midsection, and mid-density toe cap. Please click for a video about Microwobbleboard technology. Textured synthetic outsole delivers long-lasting durability on a variety of surfaces. Imported. Weight of footwear is based on a single item, not a pair. for the women~s FitFlop sizing guide. Click to learn more about the biomechanically engineered, ergonomic FitFlop&amp#174 footbed. 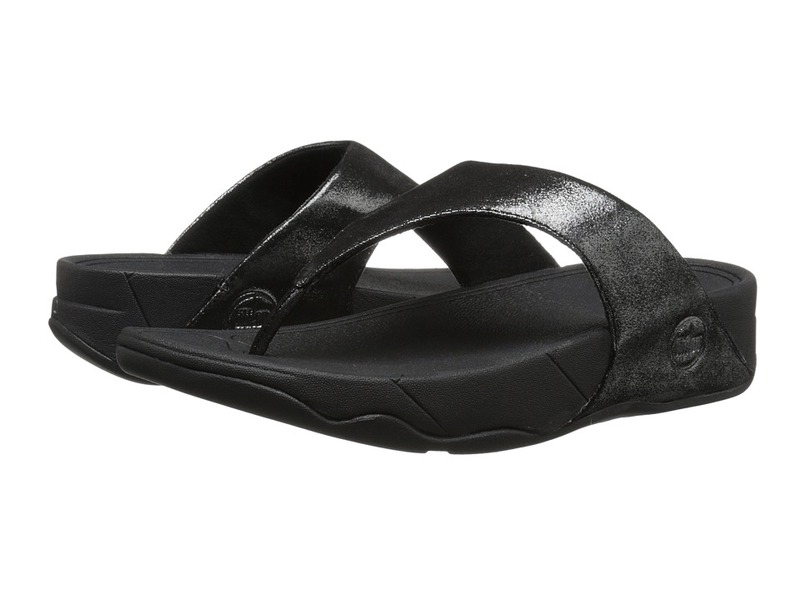 Have a little fun in the sun the with sporty FitFlop Shuv Felt. APMA Seal of Acceptance, for footwear found to promote good foot health. Soft-felt upper with minimal seaming. Slip-on design for quick and convenient on and off. Soft textile lining helps prevent abrasion. Triple-density EVA midsole with sophisticated Microwobbleboard technology. Textured synthetic outsole delivers long-lasting durability on a variety of surfaces. Measurements: Heel Height: 1 3 4 in Weight: 9 oz Platform Height: 1 in Product measurements were taken using size 8, width M (B). Please note that measurements may vary by size. Weight of footwear is based on a single item, not a pair. for the women~s FitFlop sizing guide. Click to learn more about the biomechanically engineered, ergonomic FitFlop&amp#174 footbed. 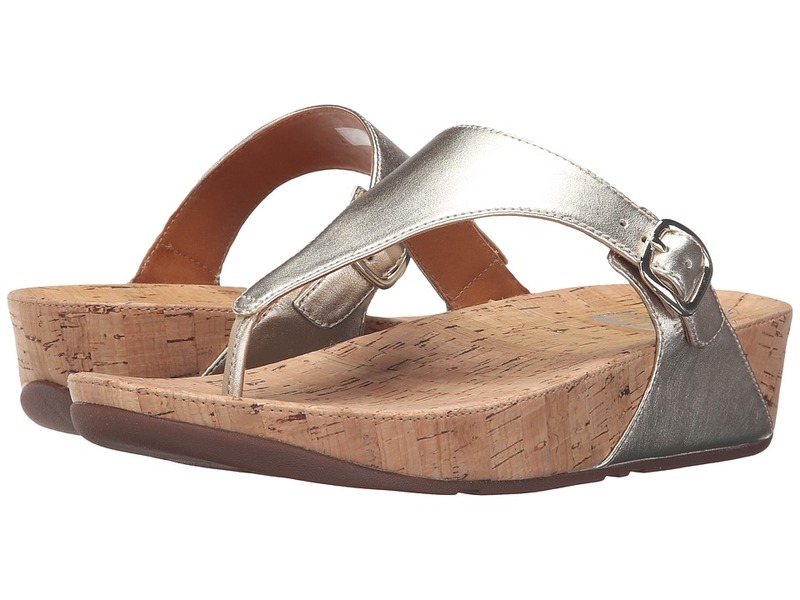 FitFlop hits a home run with the stylish and blinged out Novy sandal! Soft fabric upper adorned with rhinestones. Easy slip-on style with toe-post. Breathable and lightly padded microfiber lining provides a great all-day wear. 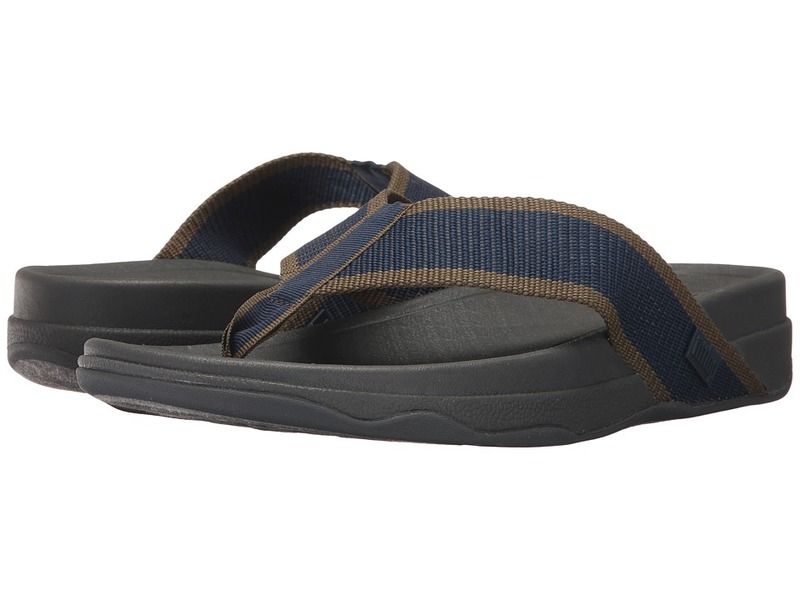 Contoured footbed and added arch support for maximum comfort and support. Triple-density EVA midsole with sophisticated Microwobbleboard&amp#8482 technology. Please click for a video about Microwobbleboard technology. Textured synthetic outsole delivers long-lasting durability on a variety of surfaces. Imported. Measurements: Heel Height: 1 1 2 in Weight: 8 oz Platform Height: 1 2 in Product measurements were taken using size 9, width M (B). Please note that measurements may vary by size. Weight of footwear is based on a single item, not a pair. for the women~s FitFlop sizing guide. Click to learn more about the biomechanically engineered, ergonomic FitFlop&amp#174 footbed. 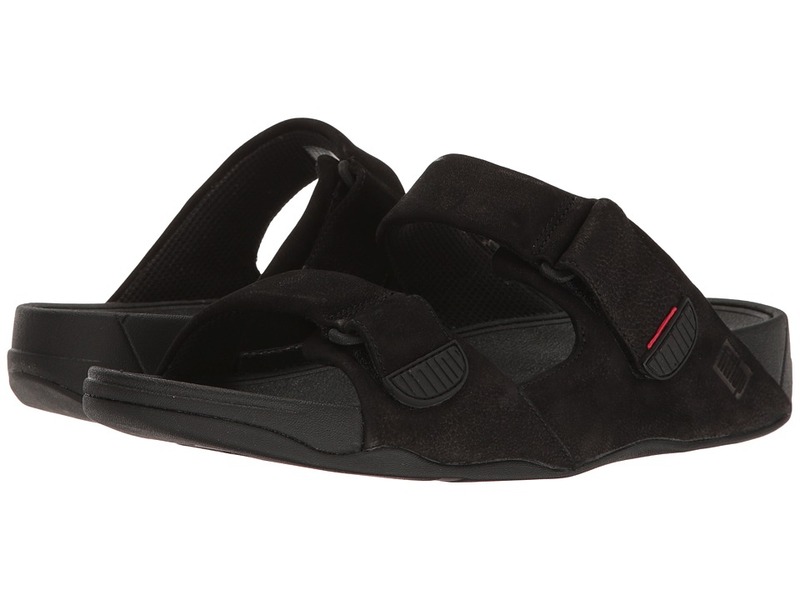 FitFlop hits a home run with the stylish and blinged out Novy Slide! Soft fabric upper adorned with rhinestones. Dual straps at vamp for an easy slip-on style. Breathable and lightly padded microfiber lining provides a great all-day wear. Contoured footbed and added arch support for maximum comfort and support. Triple-density EVA midsole with sophisticated Microwobbleboard&amp#8482 technology. Please click for a video about Microwobbleboard technology. Textured synthetic outsole delivers long-lasting durability on a variety of surfaces. Imported. Measurements: Heel Height: 1 3 4 in Weight: 8 oz Platform Height: 1 1 4 in Product measurements were taken using size 9, width M (B). Please note that measurements may vary by size. Weight of footwear is based on a single item, not a pair. for the women~s FitFlop sizing guide. Click to learn more about the biomechanically engineered, ergonomic FitFlop&amp#174 footbed. Perfect for life~s many adventures, these sandals are sure to be your go-to style for wherever the day takes you. Shimmery suede upper in a classic thong sandal silhouette. Softly padded microfiber interior lining helps prevent abrasion. Built-in arch contour. Triple-density EVA midsole with sophisticated Microwobbleboard technology. Please click for a video about Microwobbleboard technology. Features the APMA Seal of Acceptance, for footwear found to promote good foot health. Textured synthetic outsole delivers long-lasting durability on a variety of surfaces. Measurements: Heel Height: 1 3 4 in Weight: 7 oz Platform Height: 1 in Product measurements were taken using size 8, width M (B). Please note that measurements may vary by size. Weight of footwear is based on a single item, not a pair. for the women~s FitFlop sizing guide. Click to learn more about the biomechanically engineered, ergonomic FitFlop&amp#174 footbed. The FitFlop Surfa and sandy beaches are a match made in heaven! Soft fabric upper. Easy slip-on style with toe-post. Breathable and lightly padded microfiber lining provides a great all-day wear. Contoured footbed and added arch support for maximum comfort and support. Triple-density EVA midsole with sophisticated Microwobbleboard&amp#8482 technology. Please click for a video about Microwobbleboard technology. Textured synthetic outsole delivers long-lasting durability on a variety of surfaces. Imported. Measurements: Heel Height: 1 1 2 in Weight: 6 oz Platform Height: 3 4 in Product measurements were taken using size 8, width M (B). Please note that measurements may vary by size. Weight of footwear is based on a single item, not a pair. for the women~s FitFlop sizing guide. Click to learn more about the biomechanically engineered, ergonomic FitFlop&amp#174 footbed. 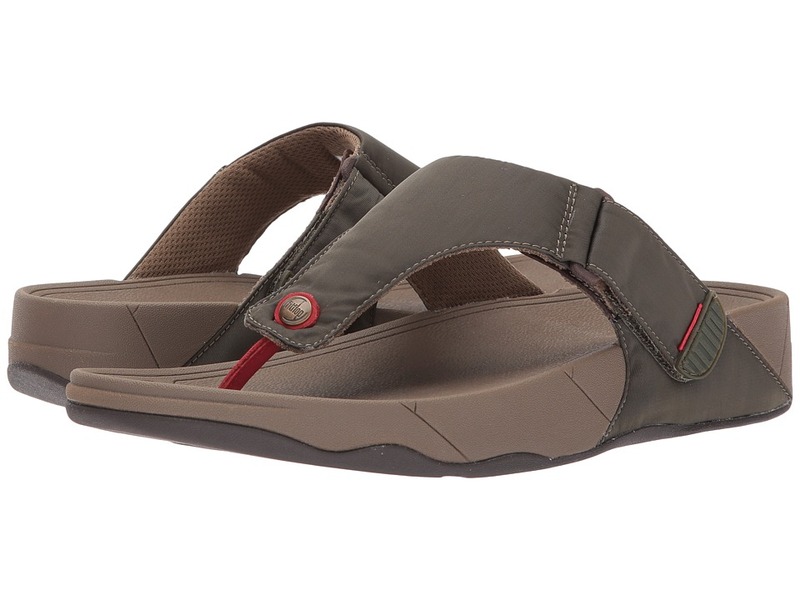 Go anywhere in the FitFlop Trakk II sandal. Thong sandal features a soft nylon upper with slim toe post. Soft microfiber interior lining helps prevent abrasion. Triple-density EVA midsole with sophisticated Microwobbleboard technology. Please click for a video about Microwobbleboard technology. Textured synthetic outsole delivers long-lasting durability on a variety of surfaces. Imported. Measurements: Heel Height: 1 1 2 in Weight: 9 oz Platform Height: 1 in Product measurements were taken using size 12, width M (D). Please note that measurements may vary by size. Weight of footwear is based on a single item, not a pair. for the women~s FitFlop sizing guide. Click to learn more about the biomechanically engineered, ergonomic FitFlop&amp#174 footbed. Make your way to your nearest sandy beach and get ready for the swells in the Surfer. Durable, woven nylon uppers. Slip-on for easy on-and-off. Features an ergonomic Microwobbleboard&amp#8482 midsole that offers excellent shock absorption and instant relief from underfoot pressure. Please click for a video about Microwobbleboard technology. Rubber outsole with treading for added traction. Imported. Measurements: Weight: 8 oz Product measurements were taken using size 12, width M (D). Please note that measurements may vary by size. Weight of footwear is based on a single item, not a pair. for the women~s FitFlop sizing guide. Click to learn more about the biomechanically engineered, ergonomic FitFlop&amp#174 footbed. Keep fatigue at bay with the performance boosting Gogh Pro Superlight. Premium leather upper in a clog silhouette. Roomy toe box. Slip-on design with a pivoting heel strap and buckle closure. Soft foam backed, AEGIS treated microfiber lining help keep feet dry and odor-free. Microwobbleboard EVA midsole features a high-density heel, low-density midsection, and mid-density toe cap. Please click for a video about Microwobbleboard technology. Lightweight, durable, treaded rubber outsole. Imported. Measurements: Heel Height: 1 1 2 in Weight: 8 oz Platform Height: 1 in Product measurements were taken using size 9, width M (B). Please note that measurements may vary by size. Weight of footwear is based on a single item, not a pair. for the women~s FitFlop sizing guide. Click to learn more about the biomechanically engineered, ergonomic FitFlop&amp#174 footbed. Perfect for life~s many adventures, these sandals are sure to be your go-to style for wherever the day takes you. Shimmery textile upper in a classic slip-on silhouette. Soft microfiber interior lining helps prevent abrasion. Built-in arch support for added comfort. Triple-density EVA midsole with sophisticated Microwobbleboard technology. Please click for a video about Microwobbleboard technology. Received the APMA Seal of Acceptance, for footwear found to promote good foot health. Textured man-made outsole delivers long-lasting durability on a variety of surfaces. Imported. Measurements: Heel Height: 1 3 4 in Weight: 7 oz Platform Height: 3 4 in Product measurements were taken using size 8, width M (B). Please note that measurements may vary by size. Weight of footwear is based on a single item, not a pair. for the women~s FitFlop sizing guide. Click to learn more about the biomechanically engineered, ergonomic FitFlop&amp#174 footbed. 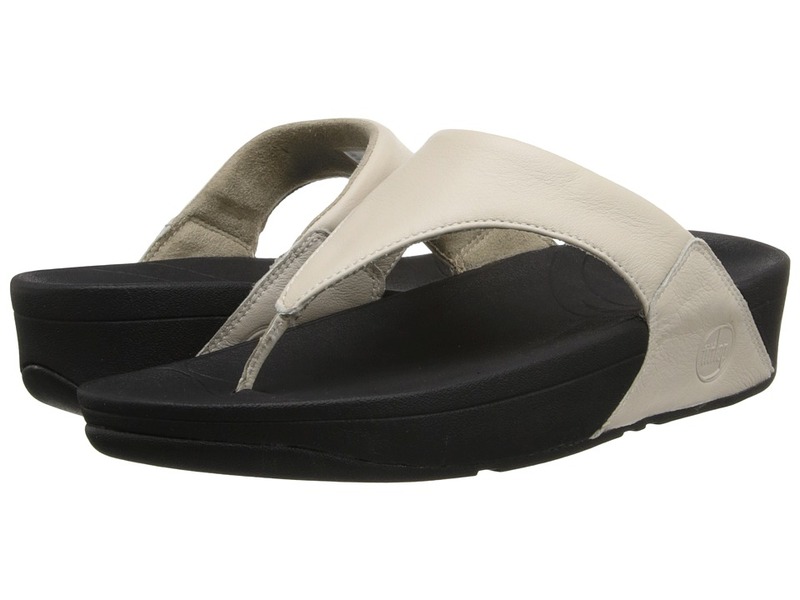 Let the Gogh Slide (Adjustable) from FitFlop be your ultimate in weekend wear. 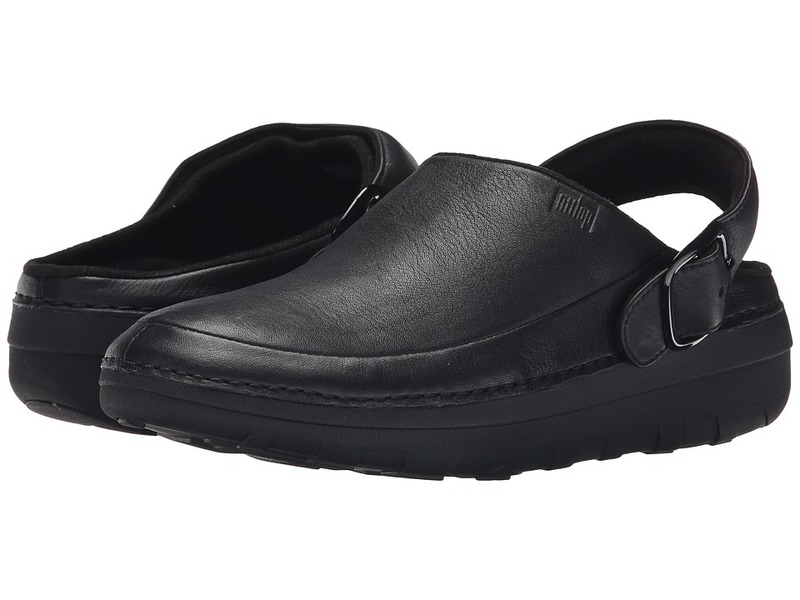 Soft leather upper with dual hook-and-loop closures for easy on-and-off wear and a secure fit. Microfiber lining has been treated with anti-bacterial AEGIS&amp#8482 to help prevent odors. Triple-density EVA midsole with sophisticated Microwobbleboard&amp#8482 technology. Please click for a video about Microwobbleboard technology. Textured synthetic outsole delivers long-lasting durability on a variety of surfaces. Imported. Measurements: Weight: 12 oz Product measurements were taken using size 13, width M (D). Please note that measurements may vary by size. Weight of footwear is based on a single item, not a pair. for the women~s FitFlop sizing guide. Click to learn more about the biomechanically engineered, ergonomic FitFlop&amp#174 footbed. Superskate is a sneaker with an attitude! Smooth leather or suede uppers with a round toe. Slip-on design with dual side goting for an easy on-and-off. Smooth leather and textile linings. Features the removable, SupercomFF dual-density, ergonomic, and pressure-diffusing footbed for optimum support and comfort. Please click for a video about SupercomFF technology. Durable synthetic outsole. Imported. Measurements: Heel Height: 1 1 2 in Weight: 6 oz Product measurements were taken using size 7.5, width M (B). Please note that measurements may vary by size. Weight of footwear is based on a single item, not a pair. for the women~s FitFlop sizing guide. Click to learn more about the biomechanically engineered, ergonomic FitFlop&amp#174 footbed. Get the skinny on stylish comfort with FitFlop! Upper made with premium metallic leather uppers. Buckle at side for adjustable width. Breathable leather lining. Microwobbleboard EVA midsole features a high-density heel, low-density midsection, and mid-density toe cap. Cork-lined footbed and wedge. Please click for a video about Microwobbleboard technology. Carries the American Podiatric Medical Association (APMA) Seal of Acceptance. Textured synthetic outsole. Imported. Measurements: Heel Height: 1 3 4 in Weight: 8 oz Product measurements were taken using size 9, width M (B). Please note that measurements may vary by size. Weight of footwear is based on a single item, not a pair. for the women~s FitFlop sizing guide. Click to learn more about the biomechanically engineered, ergonomic FitFlop&amp#174 footbed. 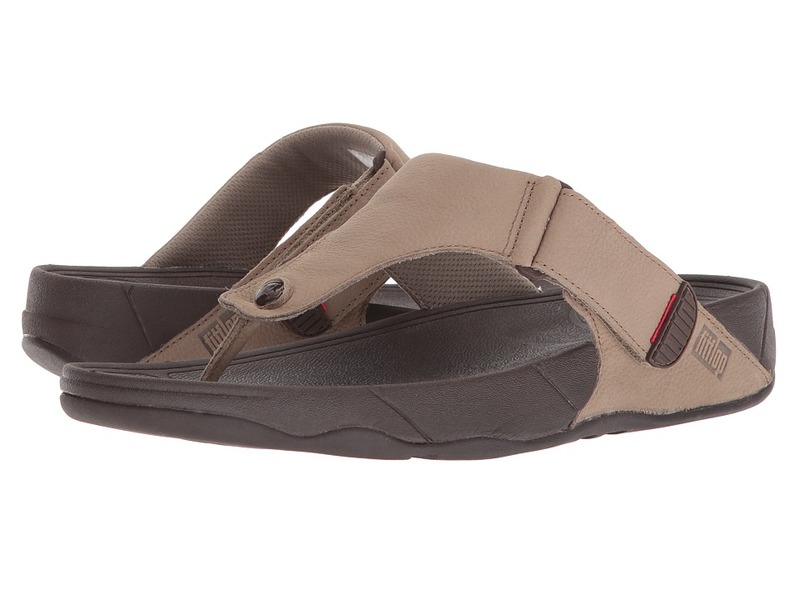 The Trakk II - Nubuck sandal by Fitflop will win you over with its handsome styling and premium comfort! Upper is constructed of nubuck leather. Easy slip-on design with open-toe styling. Classic thong-strap styling with hook-and-loop strap closure. Straps are lined with mesh padding for extra comfort. 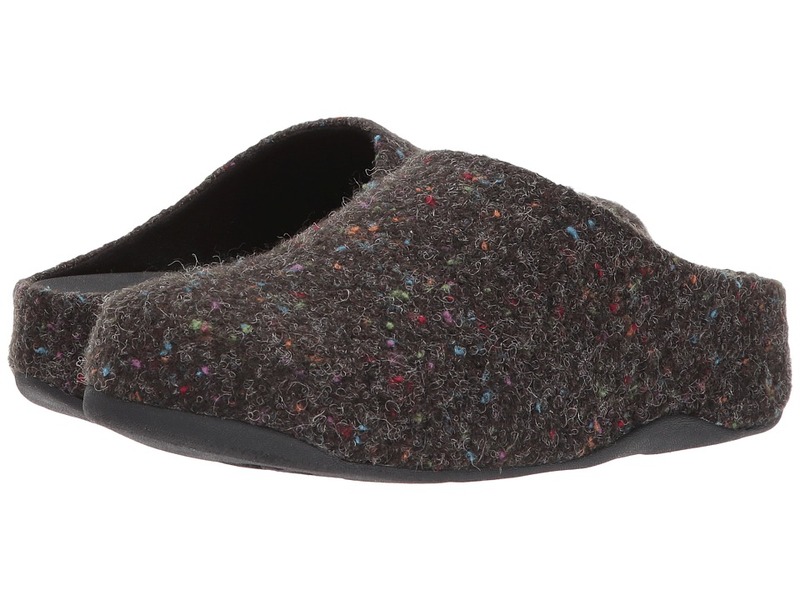 Microwobbleboard footbed delivers plush cushioning and stability. Triple-density midsole provides responsiveness and shock-absorption. Treaded rubber outsole construction for long lasting traction and slip resistance. Imported. Measurements: Weight: 10 oz Product measurements were taken using size 12, width M (D). Please note that measurements may vary by size. Weight of footwear is based on a single item, not a pair. for the women~s FitFlop sizing guide. Click to learn more about the biomechanically engineered, ergonomic FitFlop&amp#174 footbed. 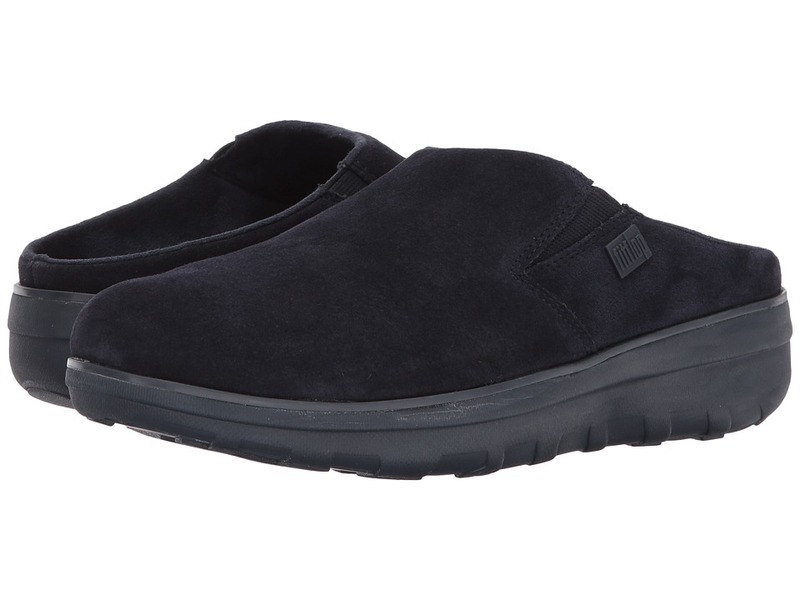 Leave your worries and discomforts at bay with the ultra-cozy Loaff Suede Clogs. Suede upper with a rounded toe. Easy slip-on style with dual goring at instep. Lightly cushioned instep and collar. Soft textile linings. Features seamless built-in arch contour for all-day comfort. EVA midsole with sophisticated Microwobbleboard technology. Please click for a video about Microwobbleboard technology. Slip-resistant rubber outsole delivers long-lasting durability on a variety of surfaces. Imported. Measurements: Heel Height: 1 1 4 in Weight: 8 oz Platform Height: 3 4 in Product measurements were taken using size 9, width M (B). Please note that measurements may vary by size. Weight of footwear is based on a single item, not a pair.